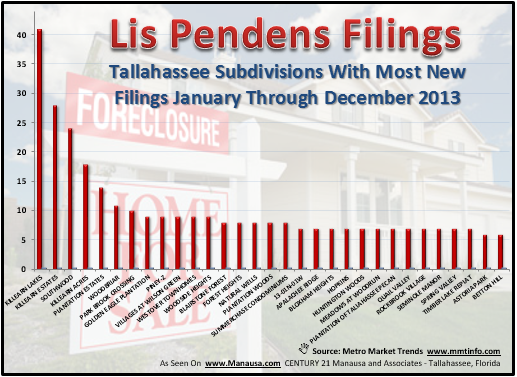 This weekend we posted our annual report on foreclosed properties, listing every new lis pendens filed during 2013 and identifying trends that we feel will impact the Tallahassee real estate market. I recommend you give it a read if you have any interest in distressed properties or if you plan on buying or selling a home this year. The included graphs show a major trend change that will impact the number of distressed homes for sale in Tallahassee this year. Today we'll look at the neighborhoods that posted the most new lis pendens filings, and which ones will likely see significant offerings this year from lenders and property owners that need to cure a problem. The real estate graph below shows the most active neighborhoods in Tallahassee, in terms of new lis pendens filings. Not surprisingly, the most popular neighborhoods in Tallahassee (most active in home sales) are producing the most new lis pendens filings for distressed properties. Killearn Lakes Plantation, Killearn Estates, Southwood, and Killearn Acres are the top four, and all four are typically among the top five in home sales every year. As a reminder, we publish weekly, monthly, quarterly, and annual foreclosure reports that bring all recent lis pendens filings forward long before you will find them on any other site. This means you can get a glimpse of future foreclosed properties and identify those which you might want to pursue even before they become available to the rest of the market. You can find these reports at the Tallahassee Real Estate Blog by clicking "Blog" in the header menu and then selecting "Foreclosures." You can also navigate directly to updated Tallahassee Foreclosure Reports by typing "/foreclosures". If you want to know more about buying foreclosed properties in Tallahassee, just drop me a note and we will show you how to have the most current information right away.